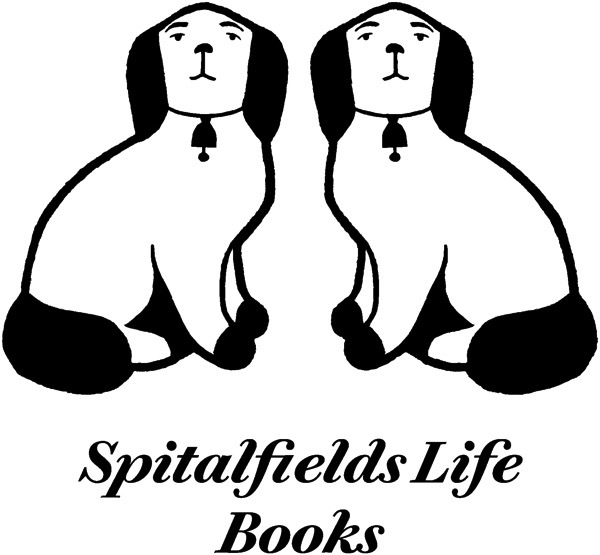 There are two forthcoming exhibitions of Adam’s maps in Knightsbridge and in Spitalfields, and Adam is giving illustrated lectures about his work at The Wanstead Tap in Forest Gate and Stanfords in Covent Garden. You are invited to join us in a celebration at both exhibition openings and details of how to book for the lectures are below. The Gentle Author visited Adam Dant in his studio in Club Row off Redchurch Street to learn of the origin of his fascination with drawing maps and the pursuit of creative cartography. The Gentle Author – What brought you to the East End of London? Adam Dant – I came here in 1993, directly from Rome where I spent a year as the Rome Scholar in Printmaking at the British School. I had often visited Brick Lane and Petticoat Lane markets in the past and, growing up in Cambridge, always entered London via Liverpool Street Station. The badly-lit, derelict streets surrounding Spitalfields Market where meths drinkers gathered around bonfires of orange boxes seemed very dark and dodgy – quite the antithesis of Cambridge with its culture of Reason, savoir faire and sandstone gothic pinnacles. On the evening I returned from Rome, the artists Tracey Emin and Sarah Lucas were hosting the closing party for their shop in the Bethnal Green Road and I bought bottles of brown ale from The Dolphin on what seemed to be a very gloomy Redchurch Street, unaware that I would be moving to this neighbourhood within a few weeks. The Gentle Author – Tell me about your studio. Adam Dant - Before I moved in, this building was a mini cab office but it was forced to close because the massive aerial on the roof was interfering with neighbours’ television signals. I used to take cabs from here, and I have a vague memory of walking past one evening and seeing it being attacked by a mob of angry scaffold-pole-wielding rival mini cab drivers. Inside it was a mess, a filthy grey carpet with haphazardly-trimmed edges and a couple of Space Invaders games in the corner. I lived here in my studio on Club Row for several years when I was a bachelor. When I moved in, I found I had the benefit of half a dozen phone lines and a stack of business cards with a blue car graphic and the words Tower Cars, Fully Insuranced. These ‘fully insuranced’ owners had sawn all the bannisters off the staircase which had a length of carpet nailed to it in a random fashion. Upstairs, an ancient water heater held together with dried-out masking tape was dripping in the corner and chicken wire covered the windows. The Gentle Author - Did you find yourself part of a community? Adam Dant - Yes, the community I entered and which coalesced around me was quite tight, due in part I think to the geography of the neighbourhood which felt like a walled enclave. It was called The Boundary. The Bengali people who lived on the Boundary Estate worshipped at two mosques on Redchurch Street and ran the butcher’s shops, grocers and garment factories, sometimes socialising at St Hilda’s, our local community centre – where I went to play badminton and run off pamphlets on the ancient Gestetner printing machine. Here on Redchurch Street, my neighbours worked mostly in creative fields. There were furniture designers, a stained glass artist, a saxophonist, a gang of Italian lesbian anarchists who drove round in a fiat cinquecento painted in pink leopardskin, a playwright, a documentary filmmaker, a rubber garment maker and many more. They lived in the curious collection of abandoned warehouses, shops and offices, and were to be found every night in The Owl & Pussycat, an ex-dog-fighting pub, where the area’s history was a frequent subject of discussion. Everyone had read Arthur Morrison’s A Child of the Jago and knew the exact location of Shakespeare’s original Theatre. They spoke about the arcane origins of the street names, claimed that a ‘ley line’ ran directly through the nicest house and on towards the bandstand at Arnold Circus. The Gentle Author - What attracts you to draw maps? 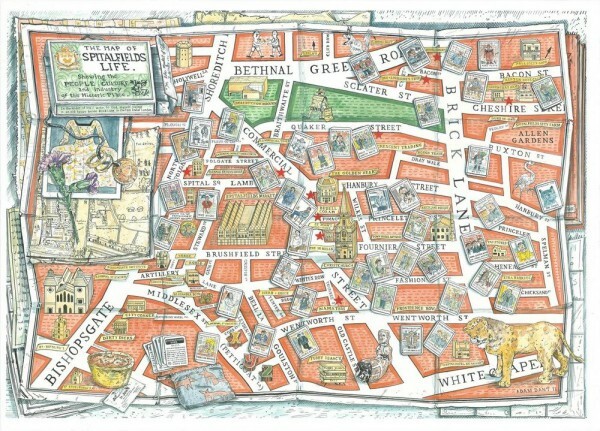 Adam Dant - I think my Map of Shoreditch in Dreams illustrates why cartography as a visual form appeals to me. The familiar, the quotidian and the eternal elements of a place can all be captured on a map, with the streets, the topography and the features providing the language to manifest a precise vision of a subjective reality, which might otherwise be overlooked in favour of a more mundane perspective. In producing my maps, I seek to depart from the obvious and superficially useful qualities of cartography. Instead, by pursuing unexpected, unlikely or challenging methods of structuring or rendering the landscape of a place on paper, I hope the outcome is a work of art rather than just a means to get from A to B. A map can be a puzzle or a game – a pictorial space where a viewer can travel through time and project themselves into history. Unlike a photograph or a topographic view, which records a location in a moment in time, a map is a representation of a place where we continue to extend the threads of physical history even if these are no longer visible due to being buried or trodden underfoot. Even when the buildings remain, the sites of our daily engagements and our cherished urban nooks and crannies are constantly being refashioned and repurposed until they disappear. The layout of our streets are dug up, rationalised and reordered. Consequently, our cities get transformed beyond recognition. Yet even when they are razed to the ground, all the places where we walk are essentially constant. In the widest and most profound sense, they part of a cosmic cartography that is eternal, infinite and immutable. As long as we live, they live in whatever form we care to imagine them . The Gentle Author - How is it possible to draw more than one map of the same place? Adam Dant – Many of my maps depict the immediate locale of my home and studio. Although my original intention in making a different map of Shoreditch every year was to familiarise myself with the area where I had chosen to live and work, I soon realised these maps were also a means of establishing my presence and identity in this place. Just as different artists will each the see same scene from their own perspectives, similarly one person can recreate the topography of a place in diverse ways on diverse occasions. There are so many contingencies when we look at a map, and we can chose to interpret these contingencies or we can we choose to take it at face value. An obvious example of this is my invention of the art historical orthodoxy known as Underneathism, depicting the world as viewed from beneath. When the familiar ‘God’s eye’ view of the earth is inverted, the resultant perspective appears strangely malevolent. Yet Underneathism also exposes the familiar reality of isometric views -utilised by Google street mapping and video games – as equally artificial. Their use of this perspective only appears to us to be the natural order because of our exposure to it through years of constant use. After a day spent in my studio creating Underneathean views, I found that stepping out into the street was as disorientating for me as it must have been for a Londoner of the eighteenth century to have been lifted up from the beer garden of a Hackney pub in a hot air balloon. The Gentle Author – Are some maps better than others? 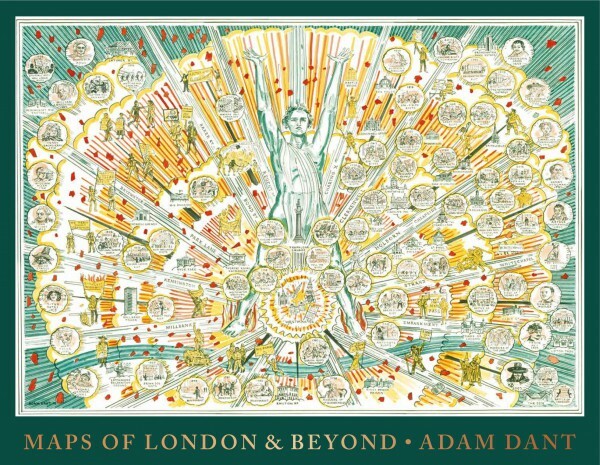 Adam Dant - Like the canon of painting or sculpture, the canon of cartography – particularly maps of London – is defined by historic moments embodied in innovative fashion and new discoveries described with prescient and appropriate perfection. The resulting maps are often born of unusual imperatives and spring from a particular circumstance. Just such an example is Harry Beck’s 1931 map of the London Underground. Despite millions of Londoners seeing it, using it and touching it everyday, it continues to reveal itself as a cartographic wonder. Unlike a famous painting or sculpture, a map can be altered, annotated, improved and fiddled with many times without impugning its integrity or compromising its innate expression. In the creation of my maps, I often start with a basic template to which I pin and glue a bunch of stuff. My work in progress often looks like those huge table maps you see in war films, with models of boats and submarines pushed across them by smart young members of the Women’s Auxiliary Air Force wielding roulette rakes. The map becomes fascinating to me when everything is in place, like the frozen moment of theatrical denouement in the tableau for a history painting. The pleasure of casting your eyes over a completed map is contingent on pinning down such a moment in its evolution, while the subject is at its most interesting – such as when the engraver Wencelas Hollar depicted the City of London viewed from the South Bank immediately preceding the Great Fire of 1666 and, shortly afterwards, during the conflagration. The Gentle Author – What do you look for in a map? Adam Dant – There are so many different kinds of map! There are maps that fill entire corridors, like those of my supposed ancestor, Ignazio Danti, at the Vatican Palace and then there are maps with covers designed by artists and proffered by London Underground, that you can slip in your top pocket. Although we need maps to show us how to get from here to there, once the map is in our hands we want to feel like the pirate who has the only existing means of finding where the treasure is buried. The Gentle Author – What do you say to people who complain they get lost following your maps? Adam Dant - You are holding it upside down! Adam Dant’s limited edition prints are available to purchase through TAG Fine Arts. Wow! This man is so articulate in speech as well as in his art work. Looking forward to purchasing a copy when i’m in London in September. 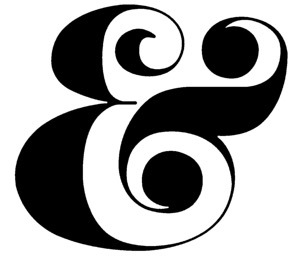 Love this wonderful website! Thank you!